This is a ridiculously short post but I was craving this like crazy the other day and was so super happy once I finally had it to nom down on. 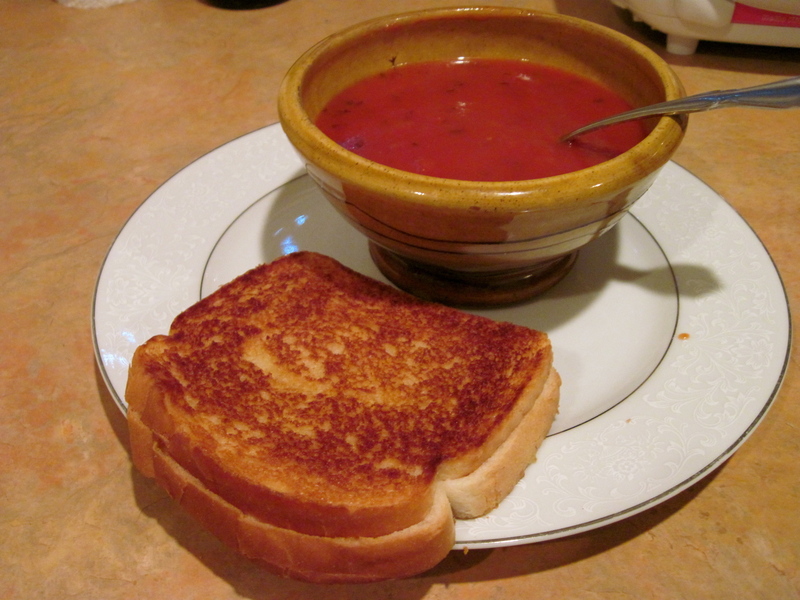 I love several of the selections that Imagine Foods has for their soups and nothing beats their creamy tomato soup when you are looking to dip a hot off the skillet grilled cheese sammich. The “cheese” of choice for these, for me, is always Tofutti. While most would go with the American slices, my palate adores the Mozzarella for this comfort food. So, anyway, silly easy and not much to tell but everyone has a comfort food, ya know. Tell me, what’s yours? I just tried mozzarella Sheese for the first time a couple of weeks ago… and made a grilled cheese sandwich with it. I added some sauerkraut the next time and thought it was even more delish. When I need comfort food, I like to make black bean soup, mac ‘n’ cheese, or a hot bowl of gnocchi.